With a lifelong passion for horses, Joe has built Winbak Farm to be one of the leading standardbred breeders in North America. Winbak Farm stands stallions in Delaware, Maryland, Pennsylvania, New York and Ontario. In 1991, Joe and JoAnn founded Winbak Farm in the Maryland horse country near Chesapeake City, a short distance from Baltimore and Philadelphia. They bought Winfield Farm, where the thoroughbred Northern Dancer was born. The contract prohibited them from using the name Winfield, so it was shortened to “Win” and they then used the names of their three children, Bradley, Ashlee and Kimberly to complete the name Winbak. 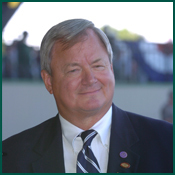 They have produced one Meadowlands Pace Winner, two Little Brown Jug Winners, two Hambletonian Winners, three Horse of the Year Winners, and over 28,500 wins with earnings over $267 Million. Joe has been involved in the industry since the late 1970s and has served numerous leaderships roles. Joe Thomson is a partner in the Red Mile Race Track located in Lexington, Kentucky. The Red Mile is one of America’s oldest (1875) and most respected standardbred racetracks. He also had served as the director for the Lexington Trotters & Breeders Association. Due to his success as a breeder and leader, he was inducted into the Little Brown Jug Wall of Fame in 2009. Joe Thomson grew up in Cynthiana, Kentucky where he participated in 4-H and showed dairy cattle. While in college at Transylvania University he worked at Keeneland and would go over to the Red Mile to watch the races. He graduated with a degree in Business Administration and Economics. Soon after he served in the U.S. Army as First Lieutenant. As a professional, Joe Thomson has had a long-standing career in the financial field. In 1999, Joe’s successful financial services business, Planco, was sold to Hartford Life Insurance Company. Joe then became a senior officer in 2001 for Hartford. In 2004, he started a new company, Pacer Financial in Paoli, Pennsylvania. In 2009, he was elected to the Insured Retirement Institute Hall of Fame for his contributions to the annuity and financial services industry. He serves on the Maryland World Trade Center Institute Board which concentrates on global opportunities for Maryland business. In addition, he is a member of the board for First Cornerstone Bank (a Pennsylvania community bank).